H264 and H265 in-camera, Pro RES 422 HQ is available when post stitching. Built-in server / Custom server / HDMI output 3840 x 1920 @30 fps ( 4K 2D livestream ) can store 8K video while livestreaming. 3840 x 3840 @30 fps ( 4K 3D livestream ) can store 6K 3D video while livestreaming. Note: Simultaneous live-streaming + recording is supported. Auto, Manual, Lens-by-Lens Custom, Shutter Priority (photo only), ISO Priority (photo only), Set ISO Upper Limit (video only). Single shot / Burst (10 continuous shots) / Timelapse / AEB (Auto Exposure Bracket, optional 3, 5, 7, and 9 photos for in-camera HDR photos) Note: Both RAW and JPG can be selected for simultaneous shooting for synthetic HDR photos and all other photo modes. WiFi Specifications: 802.11 b/g/n, 2.4GHz. Signal range is about 20 meters in open space. Max preview framerate of 30 FPS, supported in roughly 5-meter range. Insta360 Farsight provides ground-to-ground range of up to 300 meters and ground-to-air range of up to 1000 meters, with 30 FPS preview. 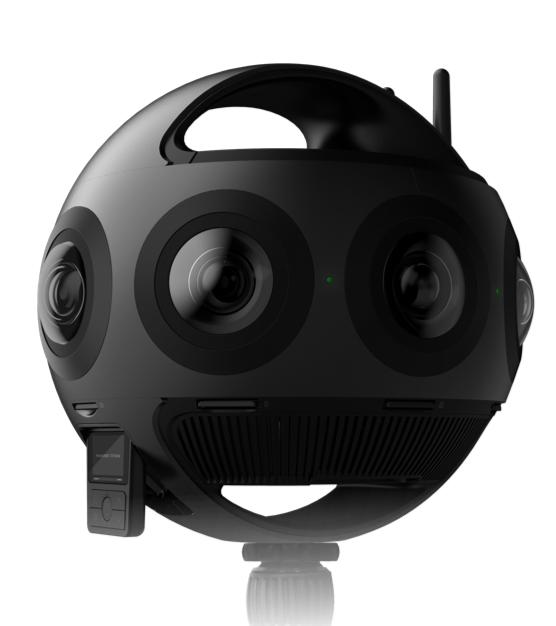 Insta360 Titan is the premiere cinematic VR camera. Reserve yours today and receive priority delivery when shipments begin in April.